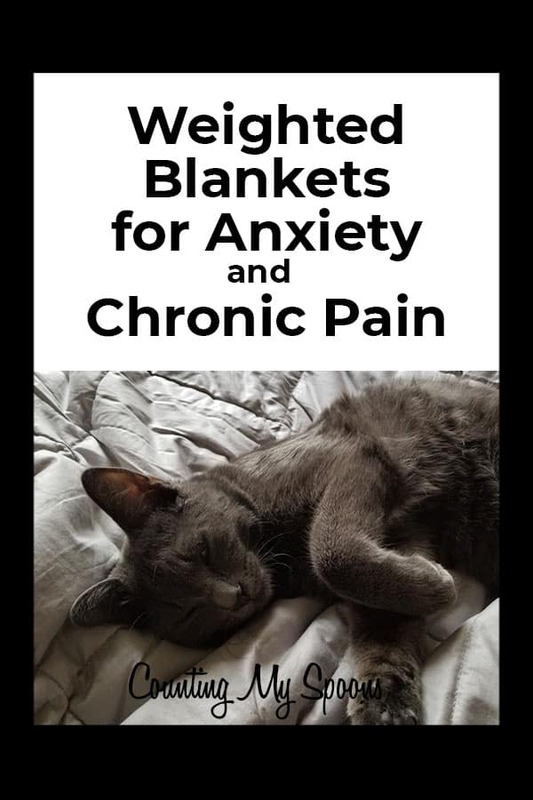 For years I’ve heard anecdotal stories about how weighted blankets have helped improve fibromyalgia symptoms, but I’d put off purchasing one because I wasn’t sure it would be worth the price. After years of wanting a weighted blanket I finally got one and I wasn’t disappointed. Years ago, when fibromyalgia was at its worst for me, I often found that piling blankets and/or pillows on top of me helped ease my pain and anxiety (mostly the latter). I found doing this especially helpful when storms moved in. Where I used to love storms prior to getting sick, I found that once fibro hit storms would set my nerves on fire. Finding ways to add weight on top of me would tamp down this feeling. I wanted a weighted blanket and believed it would help, but at the time they were hard to find and expensive. Up until recently, it was difficult to find one without having it handmade. However, in the last couple of years more weighted blankets are being mass manufactured. Sites like Amazon.com offer weighted blankets in a variety of sizes and styles. If you prefer, you can find custom, handmade weighted blankets on sites like Etsy. I saw weighted baby blankets there for $35. Be careful as you look around and read descriptions carefully to know exactly what size and weight you are getting. As a member of the Amazon Vine program I was delighted when I was offered one for review on Amazon, and knew I couldn’t pass up that opportunity. I was provided a 60×80 inch cooling weighted blanket by Serene Fox. This blanket is no joke and weighs in at 20lbs. Although, it feels heavier than that when I’m carrying it between the bedroom and couch. This blanket is actually the perfect size for a full-size bed, but is a little big to use as a couch throw. However, when you only have one, you make do. I enjoy using it on the couch over my legs when I’m just watching TV or even playing video games. On days when I’m in a flare or just not feeling well, it does make a difference. Although, I can’t really pinpoint how. I just know I feel better underneath it. I’ve slept under it on the bed a couple of nights and I don’t find this as helpful. I tend to move around a bit during the night and doing so under this blanket is difficult. Also, while this blanket is surprising cool despite the weight, I tend to wake up in the morning sweating underneath it. That said I do like the weight as I’m trying to fall asleep, but perhaps something just a little lighter would be better for me. Luckily, weighted blankets come in a variety of sizes and weights from smaller throw-size blankets, great for using on the couch, to large ones that will work as a comforter for a king-size bed. One small pilot study found that psychiatric patients who used weighted blankets reported significantly greater reductions in anxiety and distress than those who did not. Weighted blankets and weighted clothing are used to provide Deep Touch Pressure. This pressure mimics the feeling of a hug, which produces serotonin and calms the nervous system. Low serotonin has been linked to fibromyalgia and other chronic pain conditions. As a result many of the treatments for fibromyalgia involve improving serotonin through medications or supplements. A weighted blanket may be an option without medications. Have you tried using a weighted blanket? What, if any, benefits did you find from doing so? Share your thoughts in the comments below. I have had one of the weighted blankets for a bit now. I will say that I do think that it does help sometimes when I am not able to sleep. It is not 100% but I am glad that I have it. I do not use it all the time as I have a tendency to get hot while sleeping and then I wake up anyway. But I am glad that I bought one of these. Do you know what the weight is on the blanket you have? I can’t afford a weighted blanket; however, I do use a denim blanket made from old blue jeans that works in a similar fashion. I love it. Especially during weather changes and flare ups. It’s a comfortable weight and is queen sized. Heavy enough to be helpful, but light enough I can take it from bed to couch. I have also found that having the weight really does help me fall asleep. And it helps me stay asleep because even if I move around, it’s large enough to stay on the bed and it’s light enough that I don’t usually kick it off. Denim gets pretty heavy…I’d say this qualifies as a weighted blanket! Better than spending money if you don’t have to.